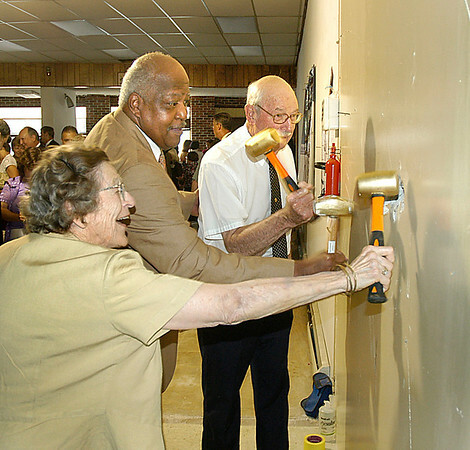 Niagara Falls, NY - A groundbraking turned into a wall breaking as honorary campaign chairs, from left, Peggy Addoms, Charles Giles and Norman Sinclair take mallets to a wall at the future home of Family and Children's Services of Niagara. Family and Children's Services of Niagara plans a one-stop family center on Main Street. The “One Stop Family Center”, will not only consolidate services under one roof, but also become an anchor project in the redevelopment of Main Street, Niagara Falls.